Great news! Some of you may remember the yummy, delicious, and healthy food we served at the 2017 Psychic Sasquatch Spiritual Retreat that was made by our friend and local food artist Jodi Hodgden. Well, my friends, she will be our chef again this year for the 2019 Psychic Sasquatch Spiritual Retreat serving up lots of wonderful dishes! Thanks to the donations we received towards the food costs, we are able to offer healthy, vegetarian and meat options, organic and non-gmo food at the same affordable rates as last year, but much higher quality nourishment and bigger portions and without the time restrictions to serve. Some of the meal themes will be Italian, Mexican, and Asian. Breakfast, Lunch, and Dinner is available in the lodge on Friday, Saturday, and Sunday, and we are also arranging to have pre-packaged meals like salads, wraps, and sandwiches for Thursday evening and Monday morning and for night time snacking options. Meal tickets are now available on Eventbrite so that you can buy for all 9 meals for $100 or select per meal for $12 each. We encourage everyone to please prepay for your meals so we can best estimate how many to cook for. Thank you all for your patience and thoughtful donations towards making this possible. At this kind of high vibrational event, high vibrational food is a must, and we received so much positive feedback about Jodi‘s cooking in 2017 that I’m sure everyone attending this year will love it too! The Sasquatch People have come out of hiding, and have begun communicating with people all over the world, shamans, healers, elders, and empaths. They have made close friendships with many. 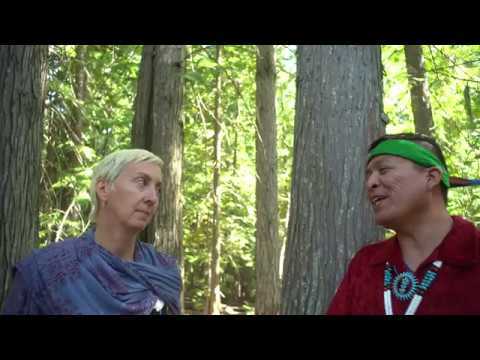 This film features interviews with several of these experiencers, who share their incredible stories of communication with the Sasquatch people. Explore the amazing reality of who the Forest People really are and hear their stories. They are ready to speak. This is part one of three movies to be released in the next month or so. If you haven’t watched part one or two yet, you should start there. They are all on the Sasquatch Oracle channel on YouTube. Also just released is Sasquatch Languages and Light Languages which was filmed during the Sasquatch Speaks shoot. Featuring Garrett Duncan and Shakara Tosha doing Sasquatch Languages and Light Languages. Also with Tammy and Anthony Chino discussing downloads. Now in existence for nearly four years, the Psychic Sasquatch Spiritual Retreat and Conference continues to strive to expand its programs and offerings to our guests. We hope that you will be able to take part in one or more of the many exciting events that we are offering this year and experience firsthand the love and energy that goes into organizing and supporting these gatherings. It is our mission to provide a peaceful, healthy, comfortable, and enlightening experience for our guests at our events. In order to meet our mission and provide services for our guests, we rely on the generosity of individuals and businesses for support. Without the assistance of unity-minded individuals just like you, we wouldn’t be able to serve those at our gatherings each year. We wish to offer the healthiest and tastiest foods available (including vegan and GF options) to our guests to ensure that it is the highest quality and vibration for our bodies. To do this, we will need to select our own fresh, organic, non-gmo, foods with the best ingredients which are often more expensive than conventional or industrial sources. We also hire chefs or caterers to create and serve these meals for our guests three times a day which is why we put such a large portion of your donations towards food costs. With your contributions, we are able to serve nutritional meals at affordable prices. Your generosity will make a difference in this community by allowing us to continue in our work. Every donation makes a difference, regardless of size. Donations can be made and tickets can be purchased at https://2019psychicsasquatch.eventbrite.com. 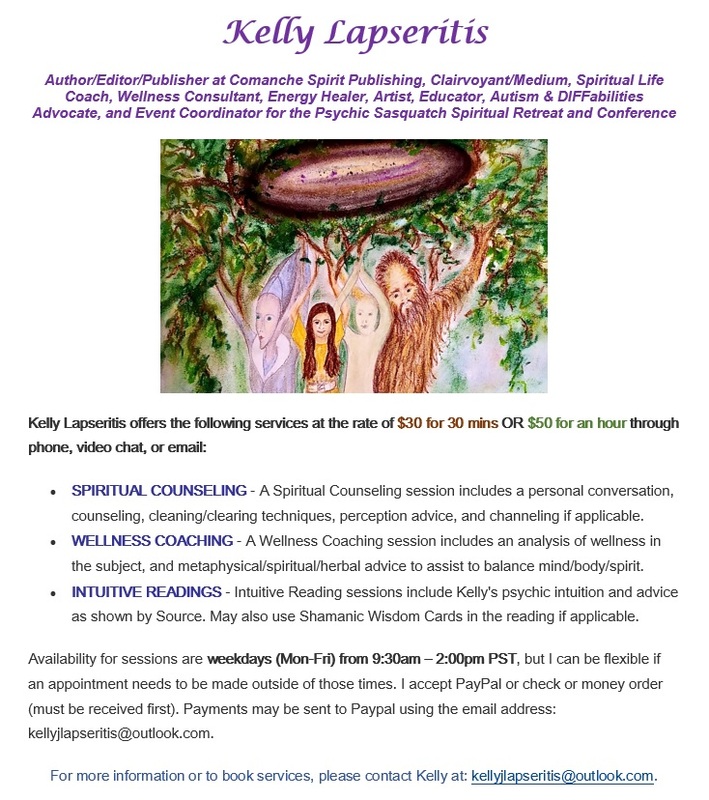 Kewaunee and Kelly Lapseritis are hosting the fourth annual Psychic Sasquatch Spiritual Retreat and Conference on Friday, August 30th through Sunday, September 1st, 2019 at the Chewelah Peak Learning Center in Chewelah, Washington. This 3-day global gathering includes conference presenters, spiritual and developmental workshops, field excursions, sharing circles, ceremonies, vendors offering products and services, meals (additional), fun activities, and many opportunities to commune with kindred spirits, nature, and our beloved Sasquatch Elders. Camping guests may arrive on Thursday 8/29 and depart on 9/2 by noon. In accordance with the Sasquatch People, Mother Earth, and all of Humanity, we propose a spiritual and ecological approach to healing ourselves, our planet, and our collective consciousness. We are all related, all children of Mother Earth, and it is our responsibility to live and work together to create peace and harmony for all living beings. Our presenters will share their own personal encounters with these sentient beings as well as the messages that have been shared with them to assist in learning Universal truths, healing ourselves and relationships, co-creating together, and understanding our perspective realities. Barbara Lamb – Psychotherapist, Hypnotherapist, and Regression Therapist, Counselor and supporter for people who experience ET and interdimensional beings. Co-author of 3 books: Crop Circles Revealed, Alien Experiences and Meet The Hybrids. The Chewelah Peak Learning Center is a beautiful wilderness campus and the perfect setting for this event that has many accommodations for everyone. Tent and RV camping is available on-site or you can also choose to bunk with others in the dorm rooms. Private rooms for families or small groups are also available, however pillows and bedding is not provided. The premises also has several hiking trails, a pavilion, fire pits, a large outdoor amphitheater, indoor restrooms and showers, clean drinking water, small refrigerators, and it would present wonderful opportunities to connect spiritually with the Sasquatch People, nature spirits, and other sentient beings that are present. The center is located about 45 miles north of Spokane, WA and just a few minutes away from the 49° North Ski and Mountain Resort in Chewelah, Washington, USA. *** Camping (dorms, tent, or RV) guests may camp out on Thursday evening (8/29) and stay until Monday afternoon (9/2) at 12:00pm. Are you vending for one, two, or three days? If less than 3, which days? Once this information has been provided and approved, a code will be sent to access the Vendor ticket types so that you may purchase them. Meals will be available for purchase separate from the regular ticket price. Attendees may also bring your own food. Limited refrigeration space is available as well as cooking options so bringing your own cooler is ideal (propane stoves are also permitted). Prices are subject to an additional service fee from Eventbrite. All children 14 and under are free*. $30 per person for the full day of events including conference and workshops^. Does not include the price of meals. $150 per person for the full 3 days of events including camping for 4 nights, conference, and workshops^. Does not include the price of meals. $20 per person per night camping in the dorm bunkhouse. This option is for children under 14 who get in for free or for people that wish to camp less than 4 days. $20 per tent, RV or vehicle for any number of people camping at the facility. This option is for children under 14 who get in for free or for people that wish to camp less than 4 days. $100 per vendor (two people) per day which includes access to the conference and workshops^. Does not include the price of meals or camping. $300 per vendor (two people) for 3 days (Fri-Sun) which includes access to the conference and workshops^ as well as 4 nights camping for one person. If the vendor brings an assistant, the assistant is subject to pay only for their indoor or outdoor camping. Does not include the price of meals. * Children under 14 are free to attend the event but there is a $20 charge per night to sleep in the dorm bunks. There is no additional charge for children staying with adults in a tent or RV. ** Scholarships available for work trade. Email sasquatchgoddess@hotmail.com to inquire. *** Refunds on tickets are available by request until August 15th, minus 25% of the total price (refund fee). 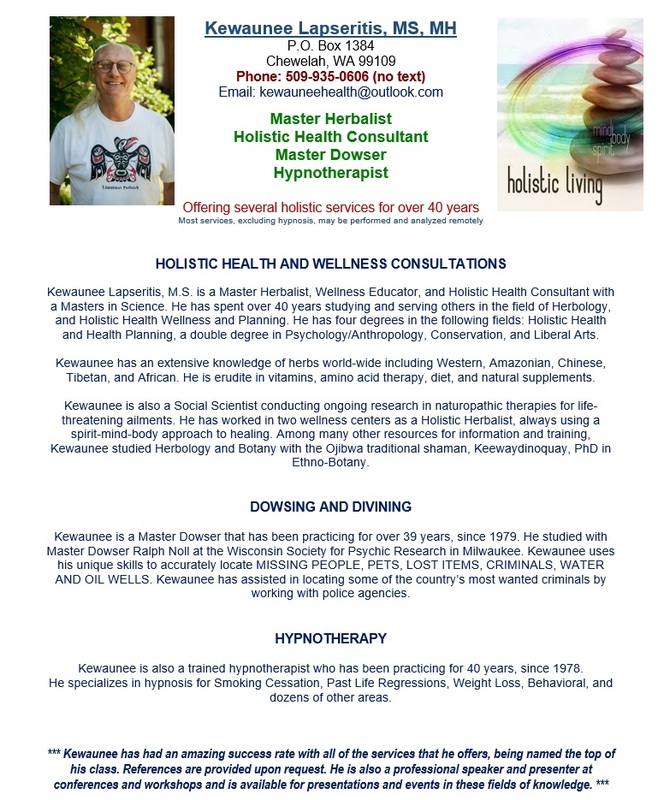 Kewaunee and Kelly Lapseritis have moved and have new contact information. The new landline phone number to reach them at is (509)590-0415. Kelly’s cell phone does not get reception at the new location, so this landline is the best way to connect to either Kelly or Kewaunee by phone besides email which is also the preferred and best way to connect. Thank you and best blessings!